I'm very happy to know there's a cookie brittle trend in progress. I'm all for thin, crunchy, jagged cookie edges that are chewy and crusty all at the same time. A very big part of being a baker is thinking about texture. 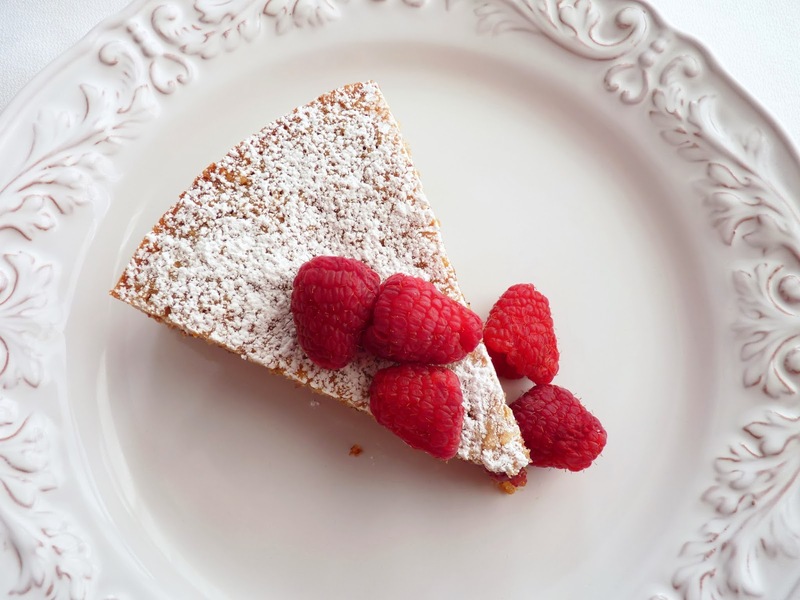 Whether it's cake, creams or cookies, you can vary ingredient ratios, cooking time and temperature to arrive at airy, dense, cakey, chewy, crunchy or creamy. Brownie Brittle shakes up the usual brownie paradigm to create a cookie that's all about texture. This recipe is based on a version from King Arthur. I substitute olive oil for the vegetable oil called for in the recipe because I love what it does with chocolate. I also added sliced almonds, doubled the vanilla and I swapped out the chocolate chips for chopped bittersweet. The recipe calls for 1 tablespoon of nonfat dry milk powder but I left that out. This is the kind of thing to make when you're looking to add a simple nibble-worthy pastry to a party tray. It's really easy to prepare and provides the chocolate buzz people crave without being too heavy, too rich or too sweet. I send all my wonderful readers my very best wishes for a Happy New Year. Thank you for all the very kind and lovely support you've shown me over these many years. I appreciate you very much. I hope you have a joyful celebration with those you love. Let's remember the past, look forward to the future and be grateful for the present. Cheers! - I used a fruity California Olive Ranch Arbequina Extra Virgin Olive Oil that I like to pair with chocolate. - 6 oz of chocolate is 1 cup. Chop the chocolate into small 1/4" pieces. Choose semisweet if you prefer a sweeter taste. 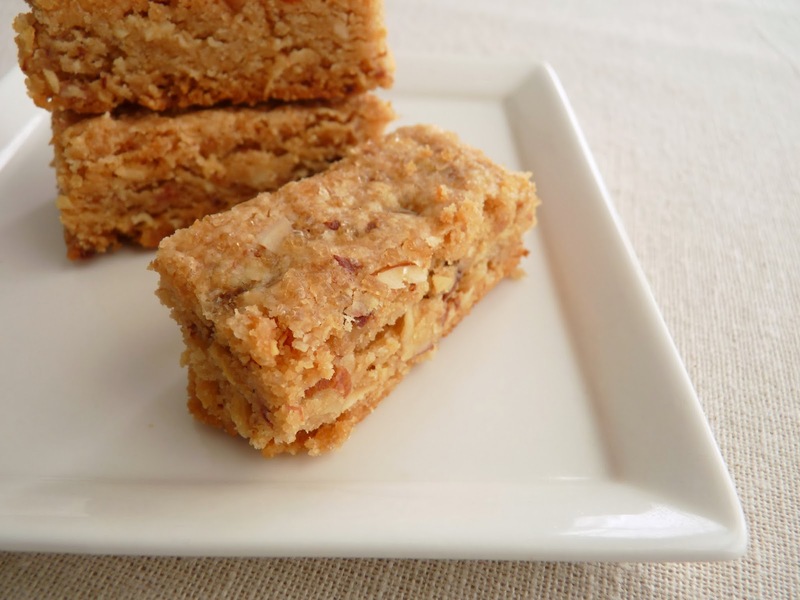 - For a toothier bite, use whole toasted almonds, coarsely chopped. - The instant espresso powder is added to enhance flavor but can be omitted. - I use a small offset spatula to spread the dough out to a thin 1/8" layer. - You can make neater slices by scoring the baked dough with a chef's knife as soon as it comes out of the oven. When they are cool, cut into pieces with a sharp knife. 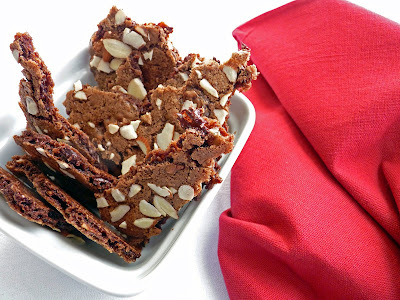 - For variation, substitute chopped hazelnuts or pecans or your favorite flavored chips. Sprinkle the top of the dough with a light dusting of sea salt. Add a pinch of spice to the flour mixture or a bit of peppermint extract instead of vanilla. - Store in an airtight container at room temperature. Preheat oven to 325 degrees F. Line two baking sheets with silpats or lightly greased parchment. Sift the flour, salt and baking soda. Set aside. Whisk the egg whites until frothy and opaque. Add the sugar and whisk until thoroughly combined. Add the cocoa powder, espresso powder, oil and vanilla and mix until smooth. Switch to a spoon and mix in the flour mixture. 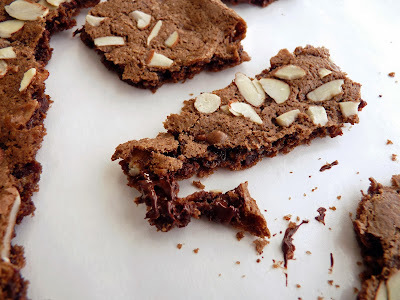 Add the chopped chocolate and half of the almonds and stir until evenly distributed. Divide the dough in half and place each half on a prepared baking sheet. Spread the batter out to about a 9" x 6 1/2" rectangle and a thickness of about 1/8". Sprinkle remaining almonds on top of each sheet. Bake the brittle for 20 minutes, rotating the pans halfway through. Place the pans on a wire rack to cool completely. Break into pieces. One of my favorite cookies is the Linzer. Packed with nuts and spice and sandwiched with a layer of raspberry or apricot jam, it's among the best of the season. Linzer Cookies are a permutation of Linzertorte, a tart that dates back to a 17th century recipe from Admont Abbey, a Benedictine monastery in Austria. 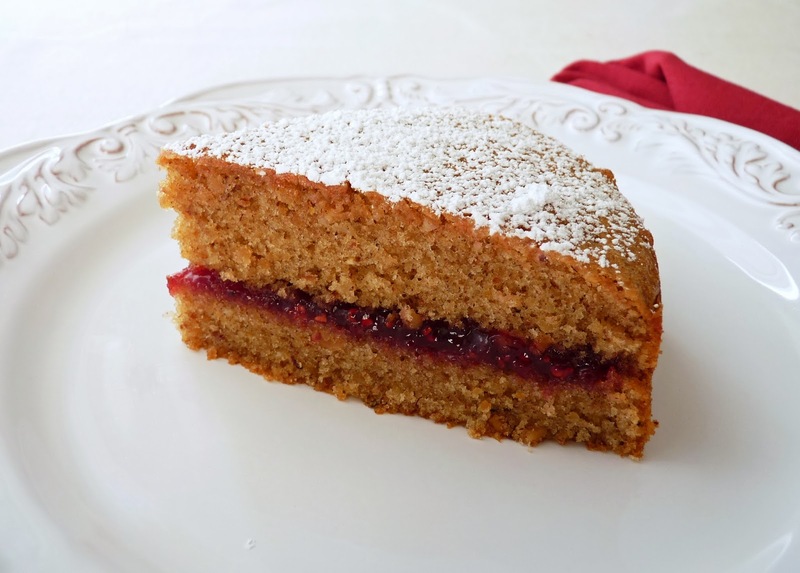 Linzertorte is made with a spiced nut pastry dough, filled with jam and topped with a criss-cross lattice of pastry. This is a cake version of the flavors and scents of this delicious traditional tart and cookie. I've based the recipe on the popular Walnut Jam Cake from Gourmet. Instead of walnuts, I use a combination of almonds and hazelnuts. I've added cinnamon, allspice, cloves, nutmeg and some citrus zest to introduce the Linzer flavors. 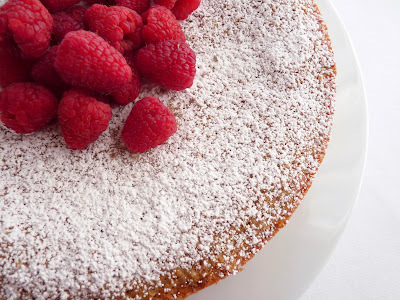 The cake is filled with a thin layer of raspberry jam brightened with lemon juice and dusted with a whisper of snowy powdered sugar. The method for mixing this cake was new to me. Since I've never mixed cake batter in a food processor, my pastry training kept gnawing at me and I was a bit skeptical about what sort of texture would result. To my surprise, the crumb is beautifully fine and tender. A revelation for quick and stress-free mixing. Wishing you and your family the very best of the holiday season. May your tables be brimming with delicious treats shared with love and joy. Cheers! 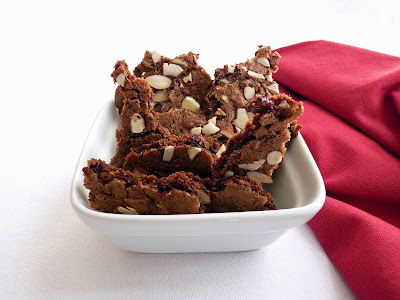 - Toast almonds in a single layer on a baking sheet in a 350 degree oven for about 10 minutes. Toast hazelnuts for about 10 - 15 minutes. Cool before using. - The Walnut Jam Cake call for 1 1/4 cups (4 1/2 oz) walnuts. I use different volumes to approximate the same weight for almonds and hazelnuts. - The recipe doesn't instruct on the temperature of the butter. I let it sit for just about 6 - 8 minutes at room temperature. Once the nuts and sugar are ground and the butter is added and processed, it begins to look like cookie dough. 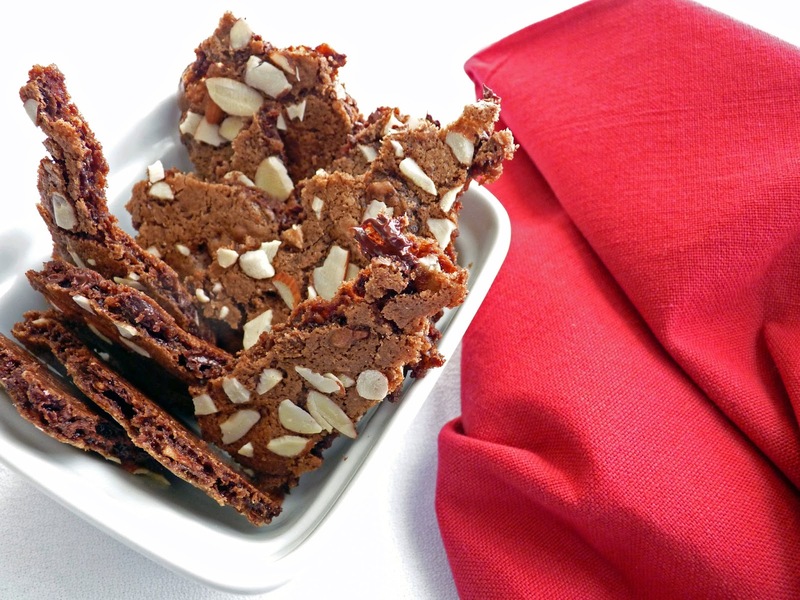 - Use just a couple of drops of almond extract to enhance the nut flavors. - Cake can be wrapped and stored at room temperature for a day or two before slicing. - Here's some guidance on how to slice a cake into two layers. I usually don't need to chill the cake before slicing and I use a long serrated knife. The removable bottom from a tart pan works well to lift the top half and set aside. - Use your favorite jam and substitute blackberry, apricot or currant, if you please. Add lemon juice to taste. - I think a thin layer of chocolate under the jam would be supreme. Just melt about 4 - 5 oz of semisweet or bittersweet and spread it evenly across either the bottom layer or across the cut side of the top layer before placing it back on top of the jam. Preheat oven to 350 degrees F. Lightly grease an 8" x 2 1/2" cake pan and line the bottom with a circle of parchment. Whisk together the flour, baking powder, salt and spices in a bowl and set aside. Place almonds, hazelnuts, sugar and citrus zest in the bowl of a food processor. Process until the nuts are finely chopped. Add the butter pieces and process until combined. Add all the eggs, vanilla and almond extract and process until thoroughly mixed. Add the flour mixture and pulse just until incorporated. Pour the batter into the prepared cake pan and spread evenly. Bake the cake until golden brown and a tester inserted in the center comes out clean, about 28 - 30 minutes. Place on a wire rack and cool for 15 minutes. Run a thin-bladed knife around the edge to loosen. Invert the cake and gently remove the parchment. Invert again and cool completely. Place the cake on a serving platter. 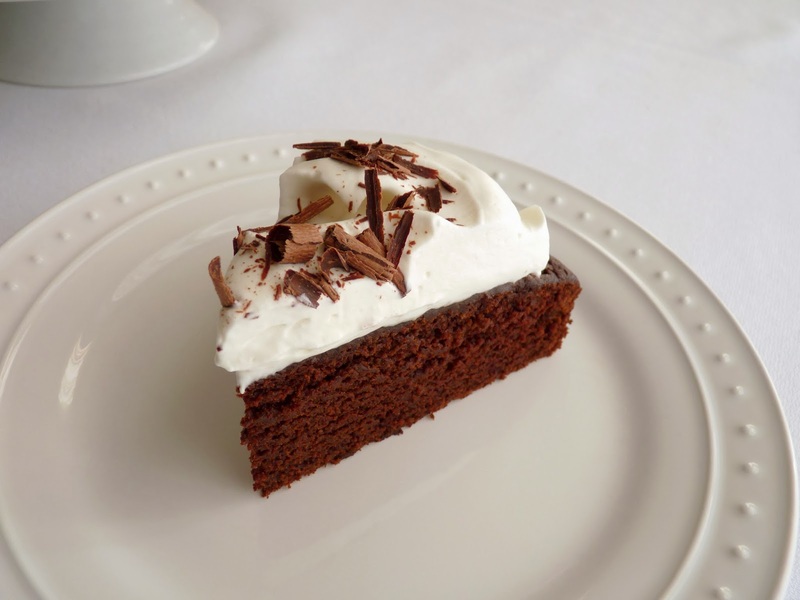 Using a serrated knife, slice the cake into two layers. Gently lift the top layer and set aside. Whisk the jam with the lemon juice together until smooth. 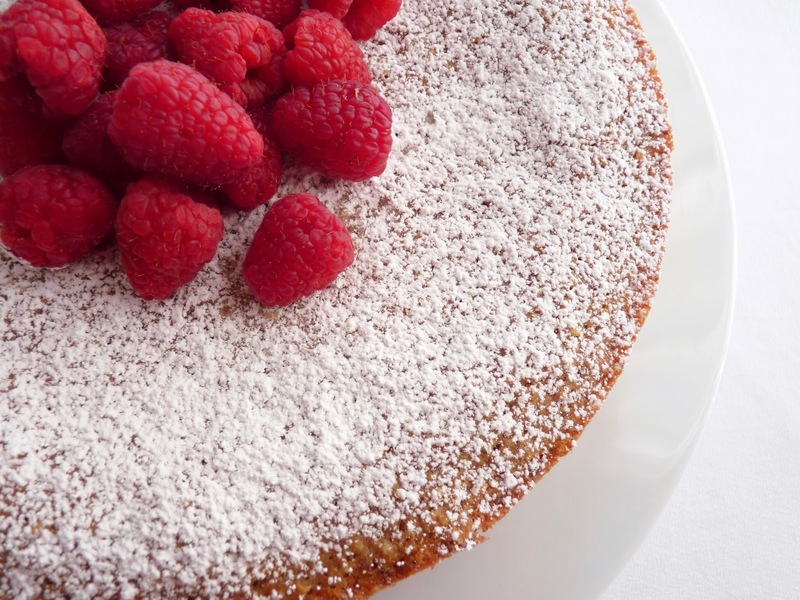 Spread the jam over the bottom layer of the cake to within 1/4" of the edge. Place the top layer over the jam and dust the the top with powdered sugar. Garnish with raspberries, if desired. The holidays call for lots of unbridled baking. 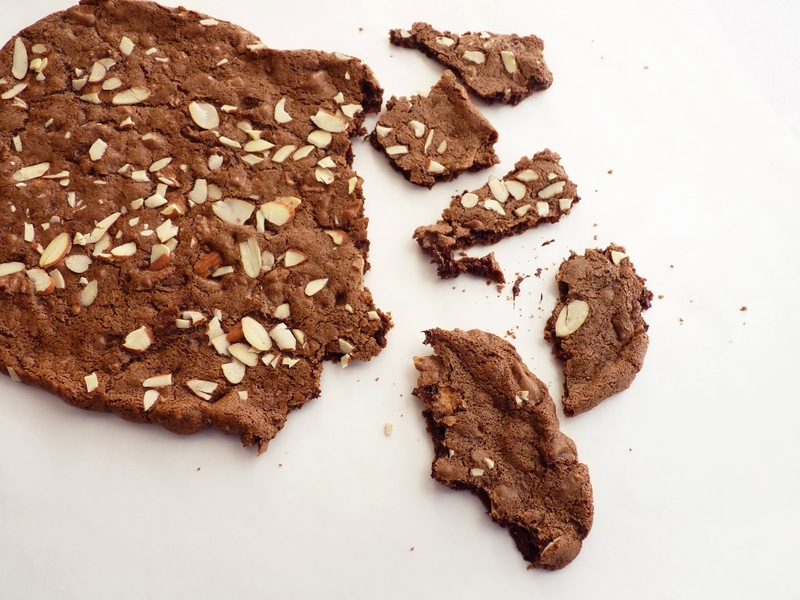 Special cookies, rich cakes and confections are on just about every baker's list. These are family and cultural pastry traditions of sharing that we look forward to each and every year. And to be sure, chocolate usually takes center stage. For this recipe, I've turned to natural cocoa to create a really delicious and festive indulgence. This is a cake with a deep chocolate flavor and a very moist crumb. I've added a good plug of rum to give it a surefire dose of the holiday spirit. Strong coffee helps to enhance the richness of the cocoa and brown sugar blesses it with a soft and warm note of pure pleasure. It's a very quick mix because the butter is melted and everything gets whisked together in no time. As chocolate cakes go, it's a very low stress but deliciously beautiful centerpiece. Serious chocolate. Serious rum. It's a rich flavorful cake without being heavy and sure to please those who are in the mood to celebrate. Served with a strong cup of great coffee, it's the answer to at least one chocolate wish. *It appears there is a problem with my subscription feed, so my apologies to all those who are not receiving the usual weekly email notification of my blog postings. I've spent a good deal of time trying to find out what the problem is, but nothing seems to work and the platform keeps telling me that the feed is working perfectly! I hope it straightens itself out ASAP. *Don't forget to order The Global Pastry Table for holiday baking and gifting! - I use natural cocoa powder, not dutch-process. - The batter for this cake is thin. The whisking creates air bubbles, so give the bottom of the cake pan a few good taps on your countertop to release them before putting the cake in the oven. - The cake bakes in just 23 - 25 minutes, so be sure to set your timer. - Letting the cake cool for 10 minutes and then turning it out of the pan ensures that it's had enough time to rest yet it's still warm enough to easily release. Parchment paper helps immensely to keep the bottom in tact. 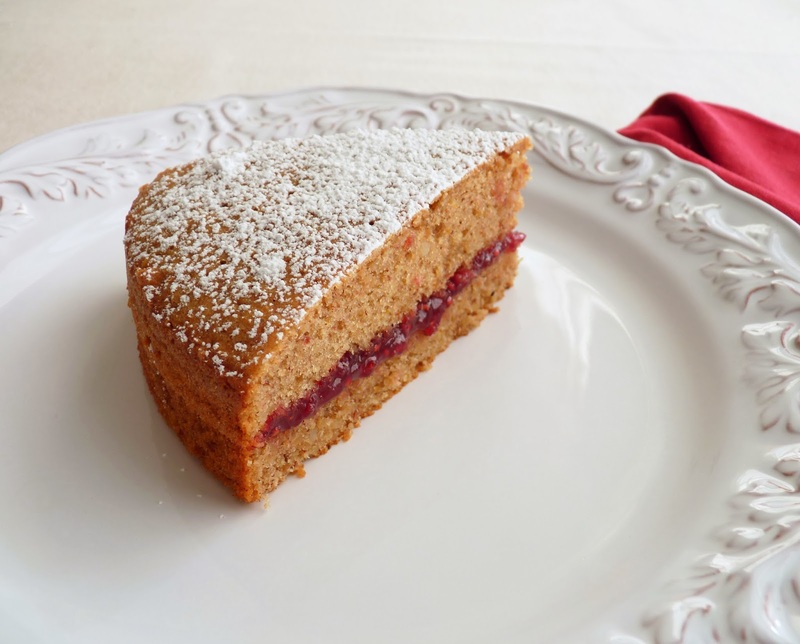 - This cake can be made a day ahead and kept in an airtight container at room temperature. The flavor improves over time. 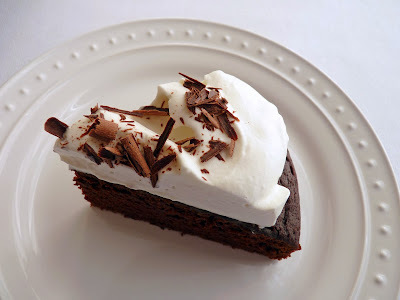 Garnish with whipped cream and chocolate shavings just before serving. - To make chocolate shavings, use a vegetable peeler on a block of your favorite chocolate. Preheat oven to 350 degrees F. Lightly grease an 8" x 2 1/2" cake pan and line the bottom with a round of parchment paper. Sift the flour, baking soda and salt and set aside. Cut the butter into small pieces and place in a saucepan along with the coffee and cocoa powder. Bring to a low simmer over medium heat, whisking constantly. When the butter is melted and the ingredients are mixed and bubbling, take off the heat and whisk in the rum and both sugars. Pour into a mixing bowl and add the egg and vanilla. Whisk until thoroughly blended. Add the flour mixture and whisk until just combined. Pour the bater into the prepared cake pan and tap the bottom of the pan a few times on the countertop to release the air bubbles. 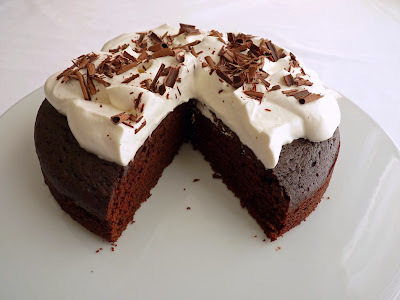 Bake the cake until a tester inserted in the center comes out clean, 23 - 25 minutes. Place on a wire rack and cool for 10 minutes. Run a thin bladed knife around the edges to loosen and invert the cake. Gently remove the parchment paper and invert the cake again. Cool completely. To serve, whip the heavy cream with the sugar, rum and vanilla just until it forms soft peaks. 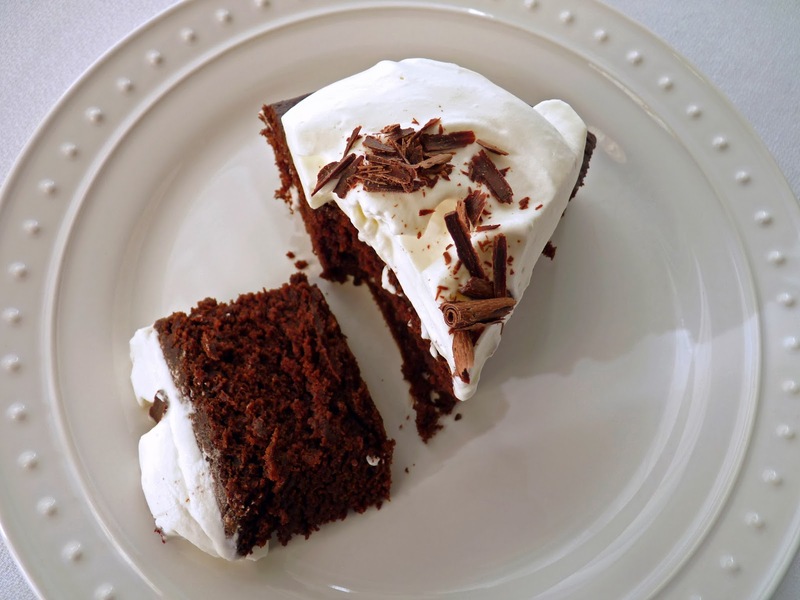 Dollop the cake with the whipped cream and garnish with chocolate shavings. Shortbread is one of the most simple and satisfying cookies to bake. There are precious few ingredients and the long slow bake ensures that its basic simplicity shines with lots of buttery flavor and tender crumbs. I don’t know anyone who would turn up their nose at an offering of shortbread. 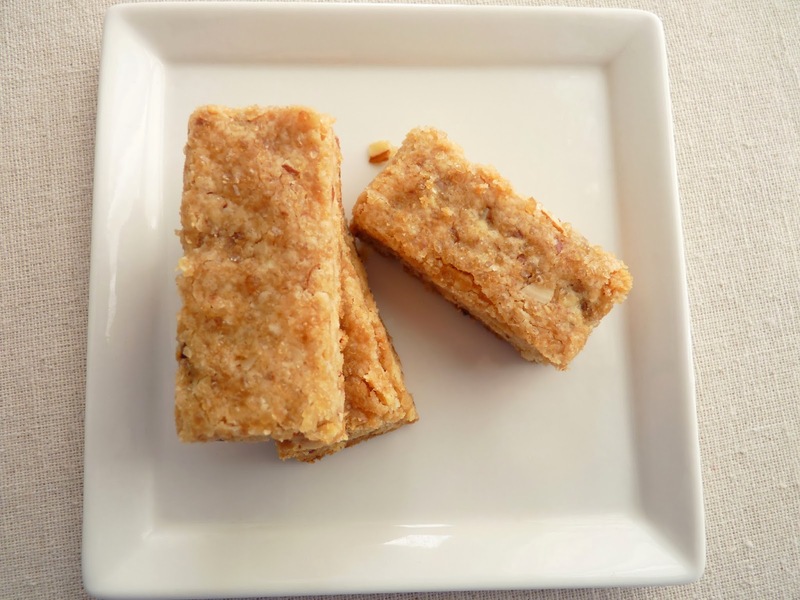 Although shortbread dates back to the 12th century and Mary Queen of Scots was greatly enamored of shortbread in the 16th century, it only first appeared in a Scottish cookbook in the mid-18th century. Since fat is the enemy of gluten, shortbread cookies are extremely tender because the abundance of butter shortens the strands of gluten. 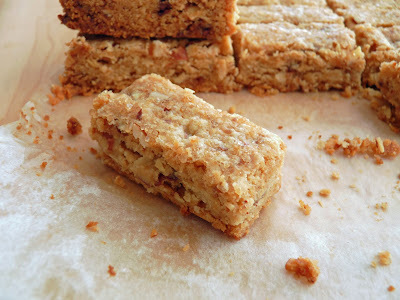 This recipe for shortbread also has some sliced almonds and coarsely chopped Heath Bar added to the mix. I don’t usually bake with candy but it’s hard to argue with the perfection of toffee and chocolate. There are a few different ways to make shortbread. The usual way to mix the dough is to cream room temperature butter with sugar and then add the dry ingredients. Another way is to melt the butter, then stir in the sugar and the dry ingredients. I’m using the food processor method where the dry ingredients are blended and then cold butter is cut in. All of these methods produce great shortbread, so choose the one with which you feel most comfortable. …and a whole lot more. There is nothing like the aroma of freshly baked pastry to fill your home, any day of the year. The Global Pastry Table also makes a welcome Christmas gift for the bakers in your life. It’s available for the iPad, Kindle and your PC or Mac desktop or laptop computer. My recipes are intended to inspire delicious journeys into the traditions and rituals of fresh and easy pastries and desserts. Cheers! - Cut the butter into 1/2” pieces and place in the refrigerator until it's time to add it. - The shortbread dough will be lumpy and should hold together when pinched. - Just to clarify, if you use the creaming method, cream the butter and both sugars until blended, then add the vanilla. Whisk the flour and salt together and add, mixing just until it starts to come together. Add the almonds and the chopped Heath Bar and mix until thoroughly combined. For the melted butter method, add both sugars and vanilla to the cooled melted butter and then add the flour and salt. Fold in the almonds and chopped Heath Bar. - If you use the method with melted butter, let the mixture rest for a couple of hours in the refrigerator before baking so the butter is absorbed. - I use the bottom of a measuring cup to press gently into the surface to smooth out my finger impressions. - Glass conducts heat more efficiently than metal, so if you’re using a glass baking pan, lower the baking temperature to 300 degrees and keep a close eye on baking time. - If you happen to under bake the shortbread, cut into pieces and toast in the oven for an additional few minutes. - Scoring the shortbread when it comes out of the oven and cutting into pieces with a very sharp knife while it is still warm will give you nice clean slices instead of jagged shards. - Store the cooled shortbread in an airtight container. It will keep for several days. - Add a tablespoon of rum or a pinch of cinnamon for variation. Preheat oven to 325°F. Lightly grease an 8” x 8” baking pan and line with parchment paper, leaving a 2” overhang on two sides. Place the flour, both sugars and salt in the bowl of a food processor and blend. Add the butter and vanilla and process just until it looks like it’s going to clump. Add the almonds and the chopped Heath Bar and process until the dough starts to clump together. Place the dough in the prepared baking pan and press evenly. Sprinkle with raw turbinado sugar and press gently into the surface. 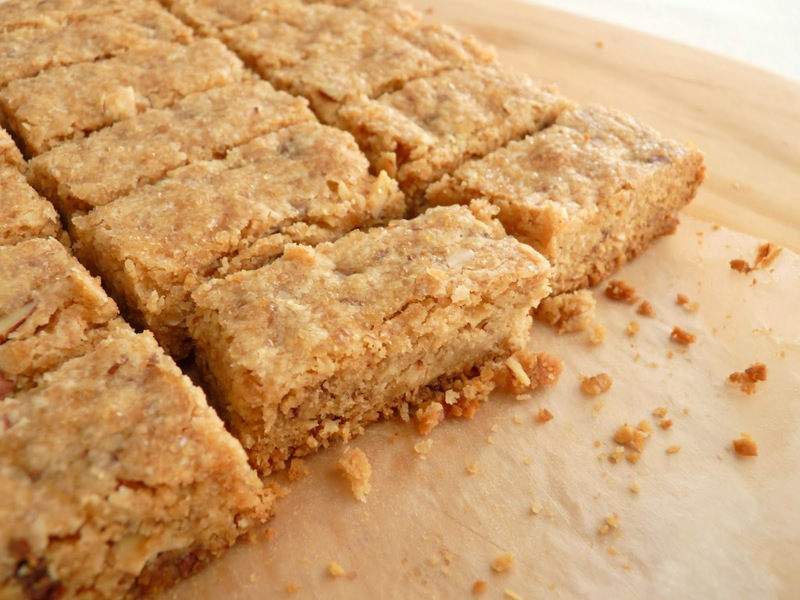 Bake the shortbread until a light golden brown, about 55 – 60 minutes. Place on a wire rack. Score the surface of the shortbread into 18 portions using the tip of a knife. Cool for 10 minutes, then gently remove from the pan using the parchment overhang to assist. Use a sharp chef’s knife to slice into pieces, wiping the blade clean after each cut. Cool completely.